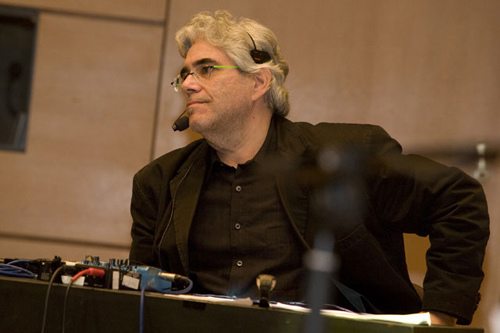 David Moss is considered one of the most innovative singers and percussionists in contemporary music. In 1991 he received a Guggenheim Fellowship; in 1992, a DAAD Fellowship (Berlin). Moss is the co-founder and artistic director of the Institute for Living Voice. In 2004, Moss re-joined Hans Peter Kuhn and Stefan Kurt to create the theater piece “Sunset Scientists”. In 2003, Moss performed as soloist with the Berlin Philharmonic under the direction of Sir Simon Rattle. He appeared as soloist in the premiere of Olga Neuwirth’s opera, “Lost Highway” as part of Steierischer Herbst Festival. Moss made his Carnegie Hall debut in 2003 with the American Composers Orchestra, under Steven Sloane. Moss returned to the Salzburg Festival in summer 2001 as “Prince Orlovsky” in the new Hans Neuenfels production of “Die Fledermaus”. In 1999, Moss was a featured soloist in Luciano Berios’ “Cronaca del Luogo” at its premiere in Salzburg. Moss sang at the Edinburgh Festival, Spoleto Festival, USA, and the Meistersinger Festival in Nürnberg in Heiner Goebbels’ orchestra work “Surrogate Cities” , and is a vocal soloist in Goebbels’ “Prometheus”. He performed as guest with the Ensemble Modern in their “Frank Zappa Project”. In 2005/06 he was featured in two new projects: first, the premiere of Sam Auinger’s multi-media opera, “The Man Made of Rain”, and second, the premiere of “Pierrot LunaiRE: REmix 05/06”, a collaboration with the Alter Ego ensemble.